Fig. 38 Equilibrium market price. 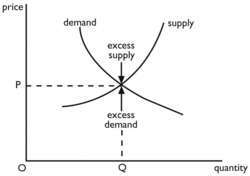 Graph showing demand and supply curves. the market clearing price at which the demand for a PRODUCT, FINANCIAL SECURITY, FOREIGN CURRENCY or COMMODITY is just equal to the supply of it. The demand curve in Fig. 38 is downward sloping, indicating that as price falls buyers will be prepared to purchase more of the product; the supply curve is upward sloping, indicating that as the price of the product increases suppliers will be prepared to offer more of it. Price OP is the equilibrium market price and OQ the amount of the product transacted. At prices initially higher than OP there is excess supply over demand which in a free market situation will cause the price to fall, while at prices initially lower than OP there is excess demand over supply which will cause the price to rise. In many markets, however, price levels are likely to be distorted both by the presence of powerful suppliers (see MONOPOLY, CARTEL, COLLUSION) and by governmental PRICE CONTROLS. See MARKET, MARKET SYSTEM, FLUCTUATING EXCHANGE RATE SYSTEM, STOCK MARKET, SPOT MARKET, FORWARD MARKET, COMMODITY MARKET. Fig. 59 Equilibrium market price. 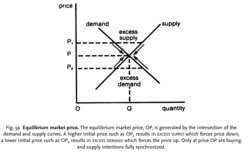 The equilibrium market price, OP, is generated by the intersection of the demand and supply curves. A higher initial price such as OP1 results in EXCESS SUPPLY which forces price down; a lower initial price such as OP2 results in EXCESS DEMAND which forces the price up. Only at price OP are buying and supply intentions fully synchronized. the PRICE at which the quantity demanded of a good is exactly equal to the quantity supplied (see DEMAND, SUPPLY). The DEMAND CURVE depicts the quantity that consumers are prepared to buy at particular prices; the SUPPLY CURVE depicts the quantity that producers are prepared to sell at particular prices. Fig. 60 Equilibrium market price (changes in). 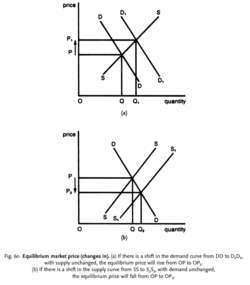 (a) If there is a shift in the demand curve from DD to D1 D1, with supply unchanged, the equilibrium price will rise from OP to OP1 . (b) If there is a shift in the supply curve from SS to S1 S1, with demand unchanged, the equilibrium price will fall from OP to OP2 . an increase or decrease in PRICE resulting from a shift in the DEMAND CURVE or SUPPLY CURVE. See DEMAND CURVE ( SHIFT IN), SUPPLY CURVE ( SHIFT IN). Another implication of our model is that there should be greater dispersion in listing prices following the bursting of a bubble--at is, listing prices at and far above the equilibrium market price should be observed. Therefore, the equilibrium market price Pe is retranslated in point P'e, into an unsustainable manner on a long time, due to the price growth from P1 to P2 (based on the artificial incomes growth) in correlation with the responsive supply extension from Q1 to Q2 (excessive "diversification" effect based on the aligning supply tendency related to an expansive demand). Tables 2a and 2b present the maximum number of finns that can be profitably accommodated, the equilibrium market price, individual output, and individual net profits for each of the eight different markets. Sufficient flexibility in prices leads to equilibrium market prices, which renders the need for effective public price control. Chipty and Witte study the effects of consumer information on equilibrium market prices and observable product quality in the market for child care.